With the holidays on my mind, we covered last week some great examples of transportation and travel blogs on Beyond Bylines. Today, I’m trying to stay mindful that the holidays also should be a relaxing time with family and loved ones. “We invite yoga teachers, students, and notables from various backgrounds to write about universal aspects of our shared human existence,” the blog says. Moving Through Fear: Do It By The Numbers – Fear Comes in Many Flavors was really striking to me. Especially with its message that “fear is pervasive in our society,” it’s really cool how the post breaks down discipline, self-study, and surrender in letting go of fear. I also liked a couple more posts from Yoga Modern: A daughter uses yoga’s wisdom to face her mother’s Alzheimer’s and Ayurveda’s sweet daily routine for self care. 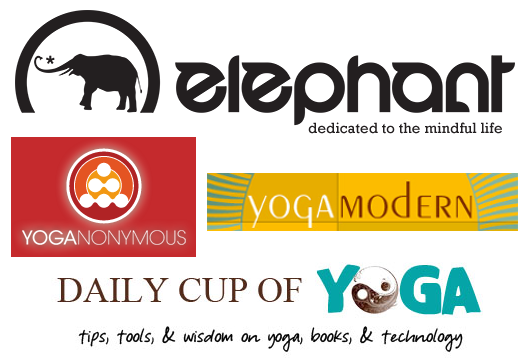 Daily Cup of Yoga is an awesome site with tips, tools and wisdom on yoga, books, and technology. I completely identify with this. When I walk away from yoga for any extended period of time, it’s amazing how much your body begins to miss it. Some posts on Daily Cup of Yoga that caught my eye include 5 Simple Tips for Becoming a Master at Meditation, 10 Benefits of Gratitude, and The Yoga of Travel. I chose Yoganonymous because of its accessible and comprehensive content. The site covers lifestyle, practice, and wellness. Some of my favorite posts include Celebrate Halloween the Healthy Way (the Ghoul-Amole Graveyard? Brilliant. ), Is Yoga Selfish?, and 7 Lessons Thich Nhat Hanh Taught Us. There’s a ton of great stuff on this site. Look up any category on Elephant Journal and you may find a host of sub-topics. Examples include Green (Bike, Adventure, Ecofashion, and Conscious Consumerism) and Enlightened Society (Right Livelihood, Equal Rights, Animal Rights, Arts, and Reviews). This is a great site. There were several posts that drew me in. Some notables include Thich Nhat Hanh is a Hero to Me, Tips & Tricks for Smart Winter Layering (This is currently perfect timing in Washington, DC. It’s chilly out there. ), and 5 Lesser-Known Ways Yoga Helps Runners. P.S. Ever wonder how we come up with ideas for our blog profiles? Our handy list of industries and subjects on PR Newswire for Journalists stays top of mind. If you’re a blogger or journalist looking for yoga and/or exercise news, let us know. We’re happy to customize that feed for you on PR Newswire for Journalists. Christine Cube is a media relations manager with PR Newswire and freelance writer. Follow her @cpcube. Namaste.